, formerly known as MyDirect .NET, is an enhanced ORM-enabled data provider for MySQL that builds on the ADO.NET technology to present a complete solution for developing MySQL-based database applications. It introduces new approaches for designing application architecture, boosts productivity, and leverages database applications. dotConnect for Oracle offers both high performance native connectivity to the Oracle database and a number of innovative development tools and technologies. It supports a wide range of Oracle-specific features, such as Advanced Queuing, Alerts, Pipes, Direct Path Loading, Change notifications, Transparent Application Failover, REF cursors, objects, packages, and others. dotConnect for Oracle provides a vast number of GUI tools that increase your productivity. It integrates into Visual Studio Server Explorer and other tools, and provides advanced visual component editors to simplify component tweaking. DataSet tools, such as DataSet Wizard, DataSet Editor, DataSet Manager, provide you an easy way to create and edit typed and untyped DataSets. dotConnect for MySQL offers enhanced ORM support with a bundled visual designer for ORM models – Entity Developer. 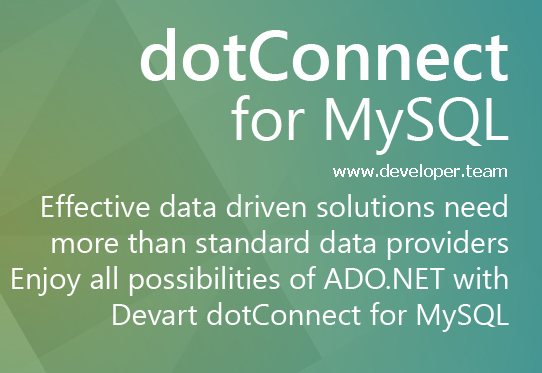 dotConnect for MySQL supports ADO.NET Entity Framework, NHibernate, and LinqConnect (formerly known as LINQ to MySQL) – our own ORM solution, closely compatible to Microsoft LINQ to SQL, while extending its functionality with its own features.